I can't draw. At all. So it shouldn't come as a shock that I've always admired those who can. In How to Draw Cute Stuff: Draw Anything and Everything in the Cutest Style Ever! artist Angela Nguyen shows the reader how to draw a variety of cute subjects from people, animals and food to other household items. Thanks to the phenomenal success of Kawaii - the Japanese culture of cuteness - the popularity of all things cute doesn't seem to be fading any time soon. 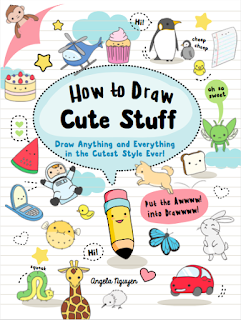 The ability to draw cute stuff can be utilised in a variety of ways: happy mail, doodling, bullet journals etc. and I was hoping to put some of these newfound skills to good use. The subjects are all cute, there's no doubting that, but many of the things being drawn are quite detailed and - in my opinion - beyond the skills of a beginner. Perhaps readers with basic drawing skills will be able to draw a policeman, ninja, eagle, tiger, school bus or helicopter by following the instructions, but I certainly wasn't able to. My favourites from the book did include the smiley face expressions, houses, and the puffer fish. (Loved that puffer fish!) The difficulty level of the majority of items exceeded my own skills as a beginner and I'm sorry to say I couldn't attempt many of them. It is for this reason I'm giving the book 3 stars.